The boys had a birthday party to go to for our sweet little friend Joseph Curry on Saturday. Leigh and Malcolm had made the best plans for the party but unfortunately, someone rained on their "horse and pony" show. None of the children seemed to mind or even notice that the petting zoo was not there because it was a great party anyway! The food was great the toys were even better (especially the rocket launcher). But...we really fell down on the picture job because there were so many people there to visit with. I think the parents had just as good of a time! Happy third birthday, Joseph!!! 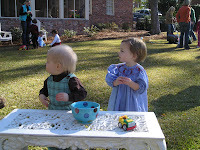 Fulton and Ellie Draffin check out what's going on as they make their way to the bowl of animal crackers. 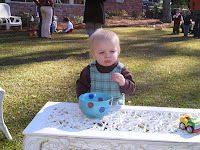 As you can see, Fulton quickly got rid of any competition and claimed the entire bowl of animal crackers all for himself!! !